Take one look at this card and you're undoubtedly thinking, "Aww!". 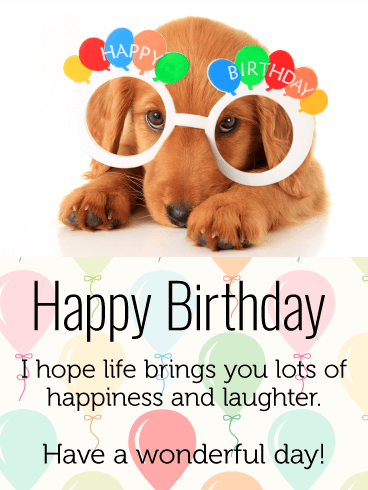 The dog itself is adorable enough, but, add in the birthday glasses, and you have next-level cuteness. 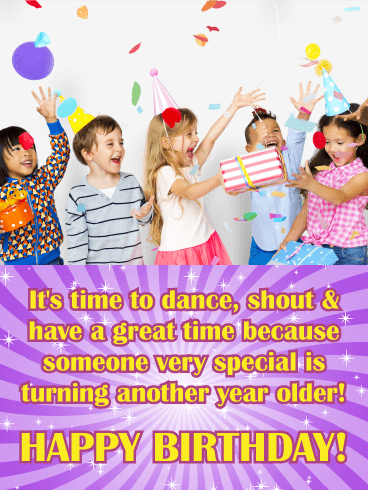 The balloon background behind the words adds a fun celebration element, while the verbiage is sweet and sincere. This is the perfect choice for any dog lover in your life celebrating a birthday! 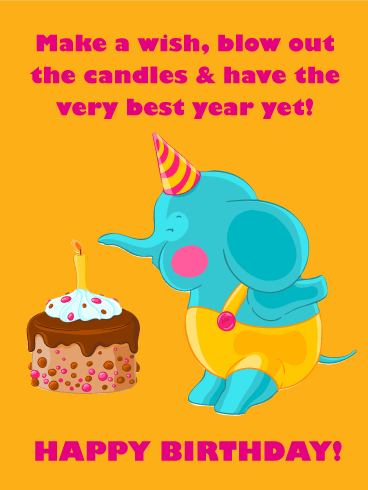 This cute little elephant is bringing a whole bunch of sweet wishes to a very special kid on their birthday! Little ones will love getting this adorable card, knowing you took the time to remember them. They'll be all ready to blow out the candles on their own cake and wish for their "very best year yet!" The entire zoo has come out to say, "We hope you have a really great day!" What could be cuter than a panda bear with a lollipop or giggling elephant? Not much - except this band of merry animals wishing a happy birthday to a lucky kid! This special children's card is sweet and fun for a little tyke in your life. 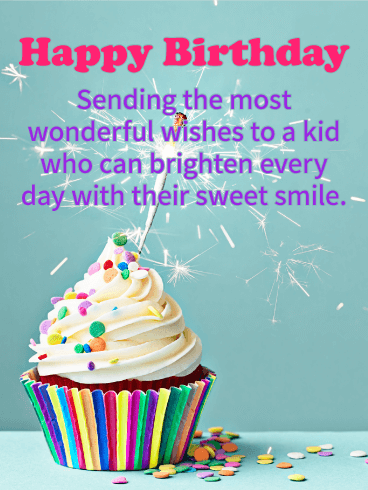 A special kid deserves a special birthday wish. 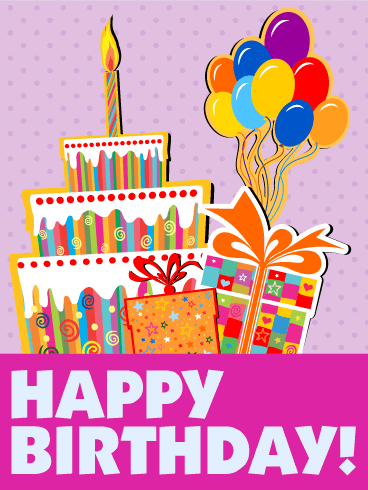 This cheerful, colorful birthday card is full of little guests ready to celebrate a friend on their big day. From the music to the cake to the balloons, it's sure to be a party they'll never forget. What a sweet way to remember them as they turn another year older! 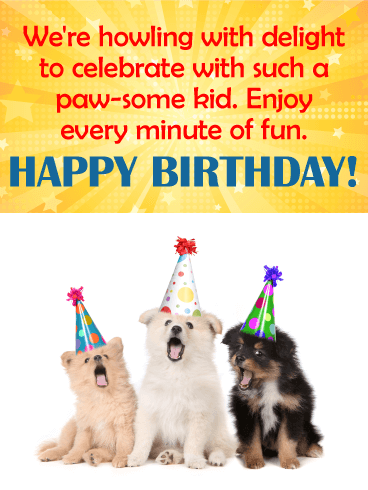 These cute little doggies are here to wish a "paw-some" kid the best birthday ever! With their party hats on and singing voices ready to "howl with delight," this is one card sure to make any child feel like celebrating in the most fun way on their big day. The party's all set for the birthday boy or girl...now all that's left is to wish them the best celebration ever! This fun, festive card, full of happy little guests, is a great way to let a special child know that you're hoping they have a day full of fun. A kid as sweet as they are deserves to be celebrated on their birthday. This birthday card is the perfect way to do it! A brightly lit cupcake with frosting piled high and confetti sprinkles sits inside a colorful wrapper, setting the scene for an unforgettable party while surprising them and making them smile. Stacks of pastel-colored cupcakes bring a cheerful touch to this birthday card for a special kid you know who's celebrating their birthday. 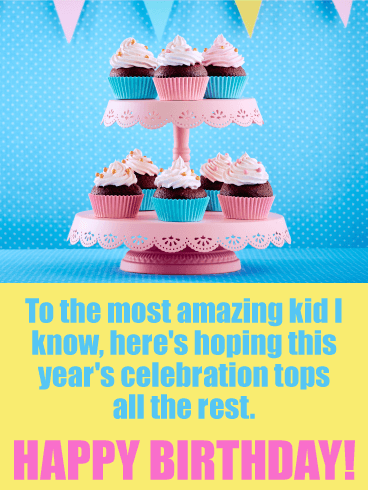 It's a chance to tell them you hope this year tops all the rest...in the sweetest way possible! 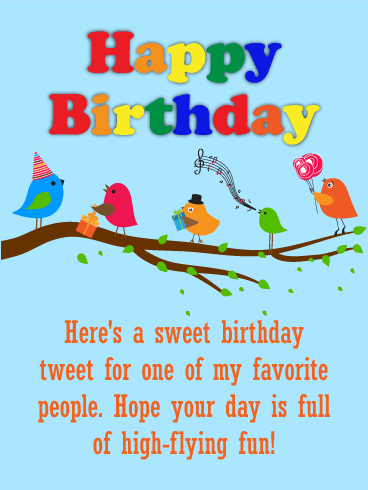 This party parakeet is here with a "sweet birthday tweet" for one of your favorite kids! Bright, colorful and full of good cheer, it's a card sure to make any child smile with delight as they know you took the time to send your best wishes. 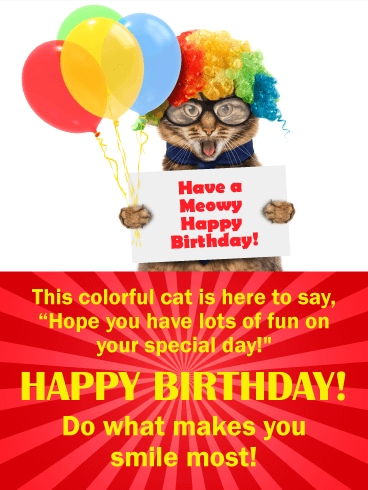 This cat isn't clowning around when it comes to helping you celebrate an awesome kid on their birthday! Armed with balloons, a colorful wig and glasses, he's got just one thing on his mind: wishing them a day full of fun and smiles. Each brightly lit candle on this cake will help wish a wonderful child in your life a very happy birthday. Perfect for kids of any age, this card is a heartfelt way to let them know how much you care with a message that's both sweet and sentimental. 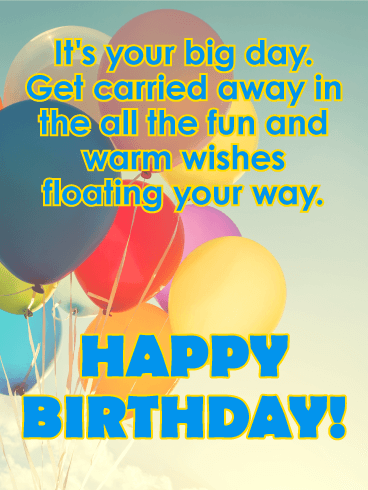 A bunch of bright balloons float in the air, bringing a fun, festive touch to this birthday card for your favorite kid! It's a chance to remind them to have a great time and get carried away in the excitement of celebrating their big day. 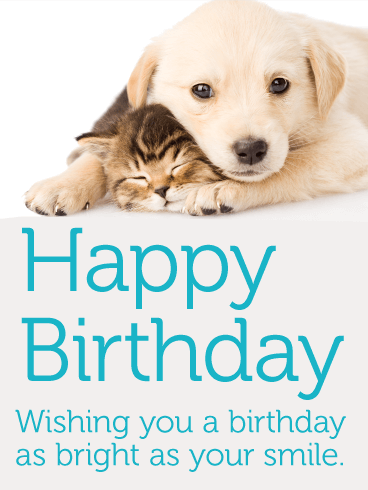 If you have a friend, family member, neighbor, or colleague who goes crazy over both dogs and cats, you've finally stumbled upon the perfect birthday card! Just look at those sweet, sleepy faces! The words on the card are kind and heartfelt, and the soft, simple coloration adds an element of serenity. The gang's all here! They're driving in on the birthday bus for some special birthday fun! They want to wish a wonderful birthday to a fun-loving kid. 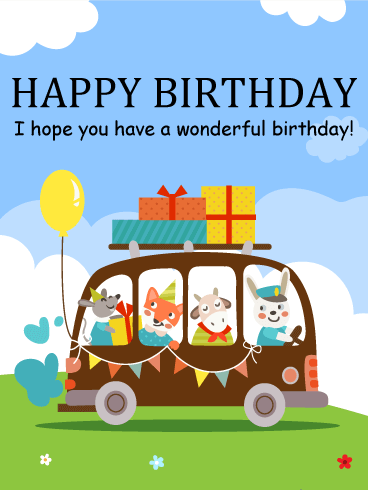 Join Miss Cow, Mr. Fox, a merry mouse and clever rabbit to wish a happy birthday to an awesome kid. It's a sunny day, and the presents are piled high on the rooftop. This can only mean one thing: It's going to be the best birthday ever! Birthdays come but once a year! So, when they do, make it a good one and wish a cool kid a day of fun, happiness and laughter. 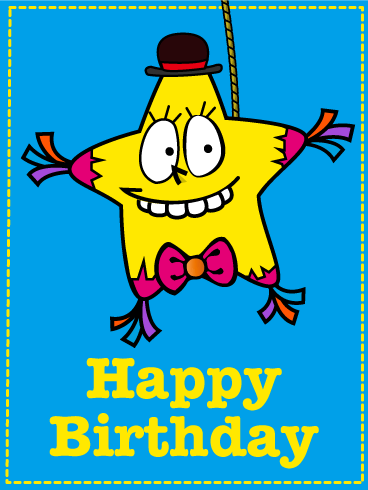 Bright, rainbow balloons fill this birthday card with colorful falling stars for wishes for a very, happy day. 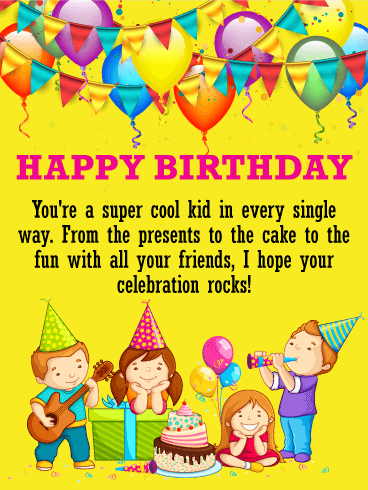 A super bright, and super cool birthday card like this one fits the bill for being awesome, so go ahead and send it now! 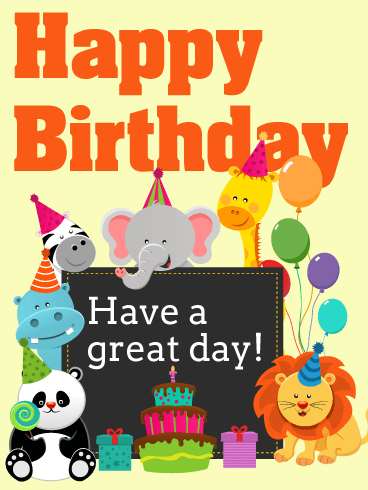 Kids are all fun, so their birthday cards should be too! This upbeat card boasts swirls and stars and bold colors for a perfect way to say happy birthday to the special kid in your life. Some cake, some presents, some balloons and you're set! The purple polka dot backdrop is simple and cute with the awesome cutouts of birthday treats on top. 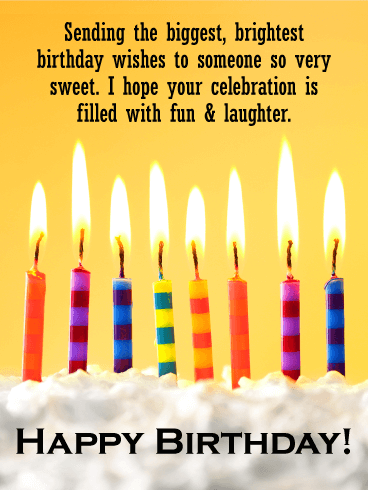 Kids of all ages will love this birthday card! It's festive and funky and downright awesome. The sunburst behind the towering layer cake ignites excitement, and makes a bold visual statement. This birthday is going to be a good one! This birthday card for kids can't be beat with its colorful fun and tasty treats. 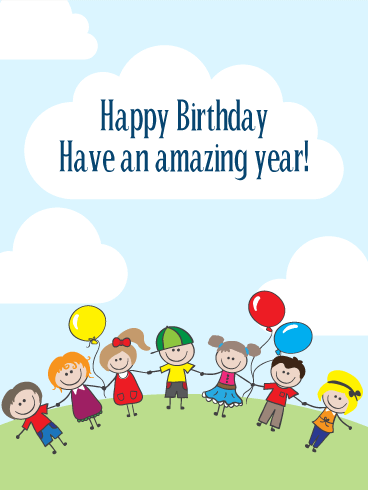 Send this birthday card to a special kid today. Grab a party hat and come on! This colorful birthday greeting is pure joy. See the special wrapped presents and the shiny balloons? See the party banner and delicious birthday cake? It's all here and ready to send, so you can wish a Happy Birthday to a special kid. Nothing says party like confetti! The birthday balloons and banners are out, the presents are ready, and the guests are here! 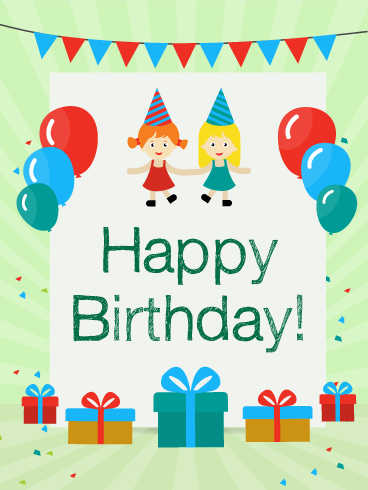 There is just one thing left to do – send this greeting and wish a Happy Birthday to a very special kid! 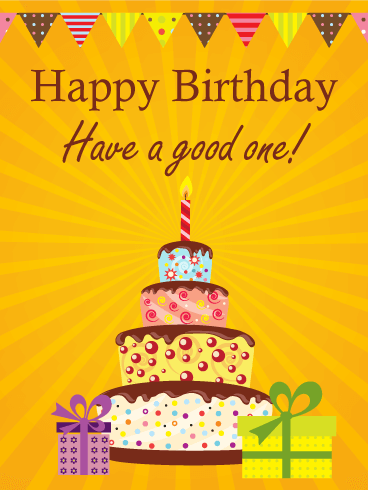 Celebrate a birthday with this festive card. The gangs all here to wish a cool kid one happy birthday! With party balloons and big smiles, they are ready to make it an amazing year. 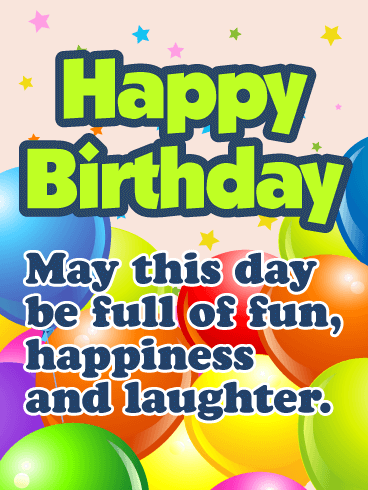 This is a great birthday card to send to a special kid in your life. 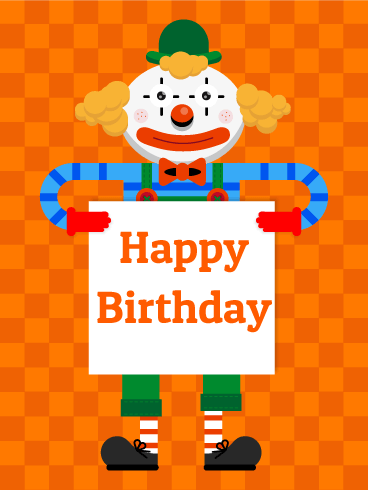 This funny clown has a special birthday message to share. 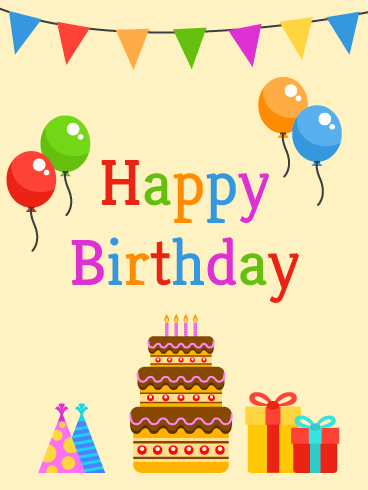 Do you know an awesome kid who is having a birthday? They will love the bright orange checkerboard background and the crazy outfit this clown is wearing. His message is sweet and simple, "Happy Birthday!" For centuries, Latin cultures have used bright and festive papier-mâché hollow shapes filled with delicious candy and treats, called Piñatas, to celebrate special moments and occasions. 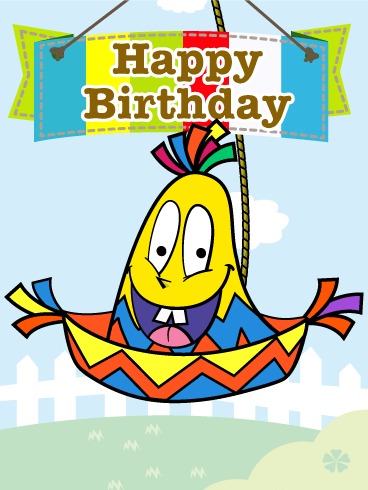 And this smiling piñata wishing a Happy Birthday is just the thing to bring extra fun to your day! How absolutely adorable is this sweet, smiling little Donkey Piñata? He's definitely too cute to bash with a stick, for goodness sake! 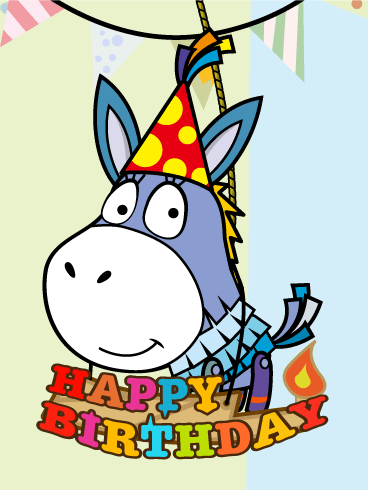 So really, the best place for this colorful and cheerful birthday card will be on the desk, counter, or mantel of the birthday boy or girl, where the Donkey Piñata can bring a smile to them, day in and day out! A birthday is a time for fun celebrations, right? Well it doesn't get much more fun than this happy Star Piñata with his very toothy happy smile! And he's dressed properly for the big occasion, too, with his dapper hat and bow tie. Your birthday boy or girl will love it!